US Navy/Mass Comm. 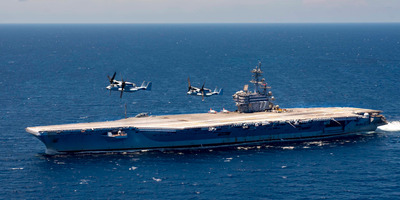 Specialist 3rd Class Brooke MacchiettoTwo MV-22 Ospreys fly over the aircraft carrier USS George H.W. Bush. August 9, 2018. The Navy said it would swap out the ageing C-2A Greyhound aircraft used to resupply aircraft carriers for new CMV-22B Osprey tilt-rotor aircraft in January 2015. As the service has gotten closer to deploying with its variant of the Joint Strike fighter, the F-35C, the need for the V-22’s heavy-lifting capacity has grown more urgent. And after a round of tests in early August, the Navy is a step closer to meeting its resupply and logistics needs. Aboard the aircraft carrier USS George H.W. 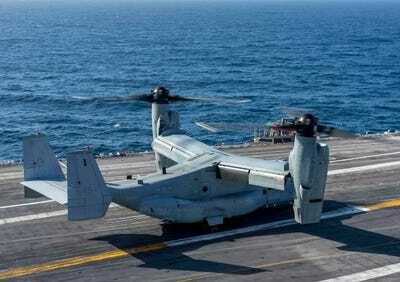 Bush this month, Osprey pilots successfully performed rolling landings and takeoffs at a total weight of more than 57,000 pounds, outstripping the C-2A’s maximum landing weight of 49,000 pounds. 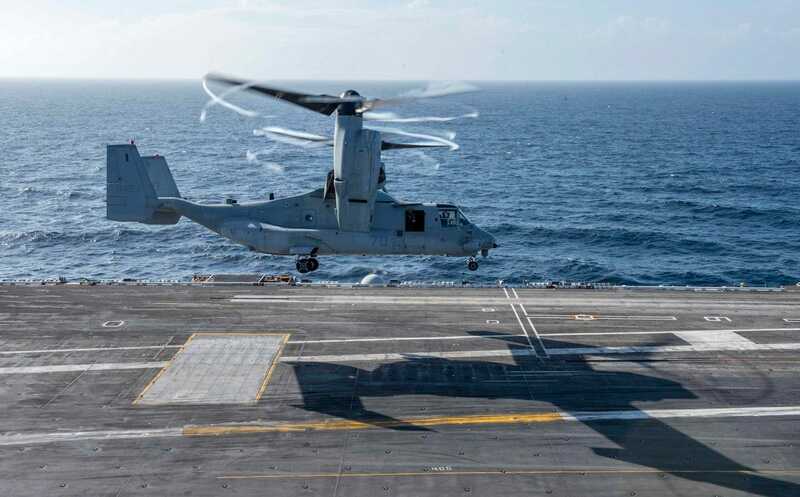 The Osprey’s vertical-lift capability, along with its ability to reach fixed-wing aircraft speed and range, make it ideal for carrier onboard delivery and vertical on-board delivery, the Navy says. That extra lifting capacity also provides a missing link in the Navy’s plans for the F-35C. 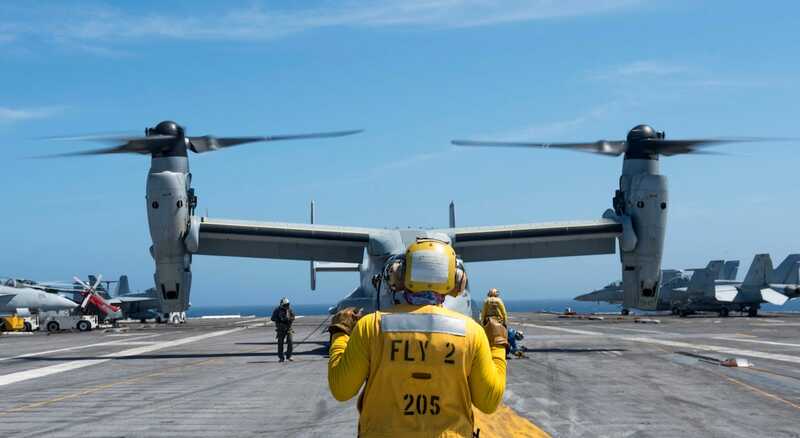 The Navy plans to replace its 27 C-2As with 38 CMV-22Bs beginning in 2020. Below, you can see how the latest round of testing went down. 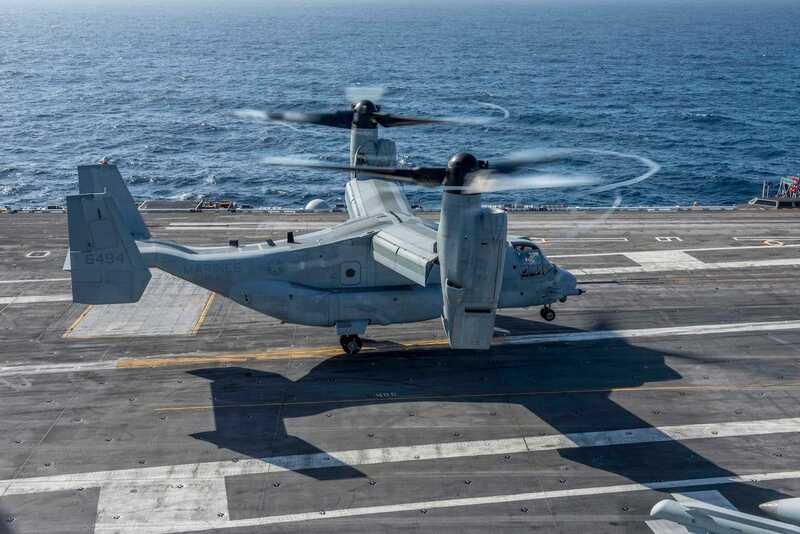 Ospreys have long been in use by the Marine Corps, but the Navy’s CMV-22B variant has some modifications to make it better suited for carrier operations. US Navy/Mass Comm. Specialist 3rd Class Roland JohnAn MV-22 Osprey lands on the aircraft carrier USS George H.W. Bush, August 1, 2018. It has more fuel capacity in the fuselage and wings, a special high-frequency antenna to aid navigation over open water, and a better intercom system to communicate with passengers. US Navy/Mass Comm. Specialist 3rd Class Roland JohnAviation Boatswain’s Mate (Handling) 1st Class Marlon Daley directs an MV-22 Osprey to land on the Bush. 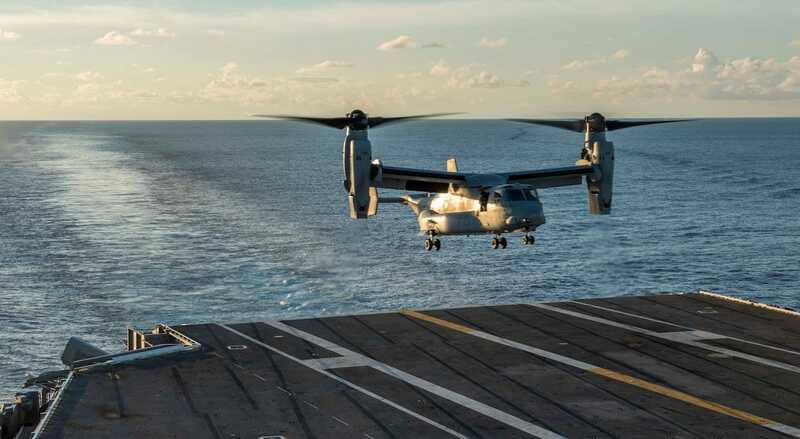 The expanded fuel capacity allows the CMV-22B to haul up to 6,000 pounds of cargo for a distance of 1,100 nautical miles, or roughly 1,265 statute miles. This beats out the Greyhound’s cargo capacity of just 800 pounds and its range of 1,000 nautical miles. US Navy/Mass Comm. Specialist 3rd Class Roland JohnAn MV-22 Osprey takes off from the Bush. US Navy/Mass Comm. Specialist 3rd Class Roland JohnAn MV-22 Osprey lands. 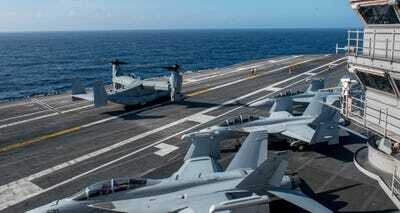 F-35Bs belonging to the Marine Corps have already been deployed on a Navy ship. A detachment of the aircraft joined a Marine Expeditionary Unit aboard the amphibious assault ship USS Wasp earlier this year — the F-35B’s first operational deployment with an MEU. 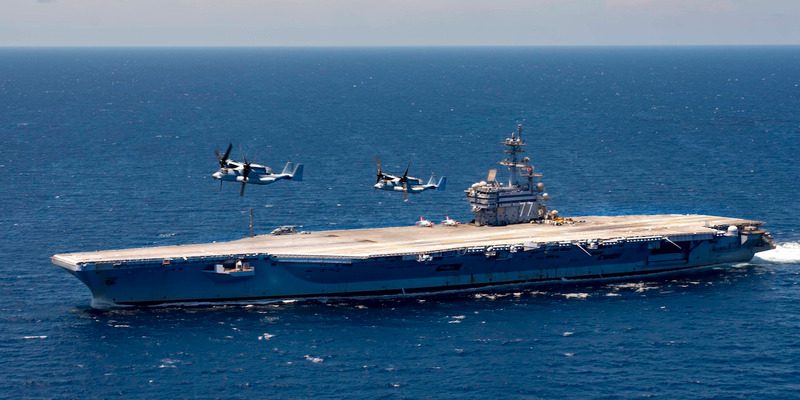 The Navy’s F-35C, the largest of the three Joint Strike Fighter variants, is slated to deploy for the first time aboard the aircraft carrier USS Carl Vinson sometime in 2021. The fifth-generation fighter is supposed to eventually make up half the fighters based on aircraft carriers. US Navy/Mass Comm. 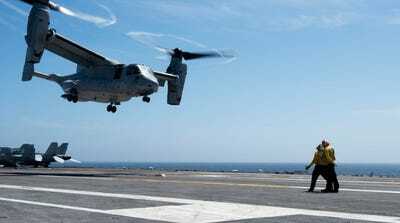 Specialist 2nd Class Joseph E. MontemaranoAn MV-22 Osprey landing. 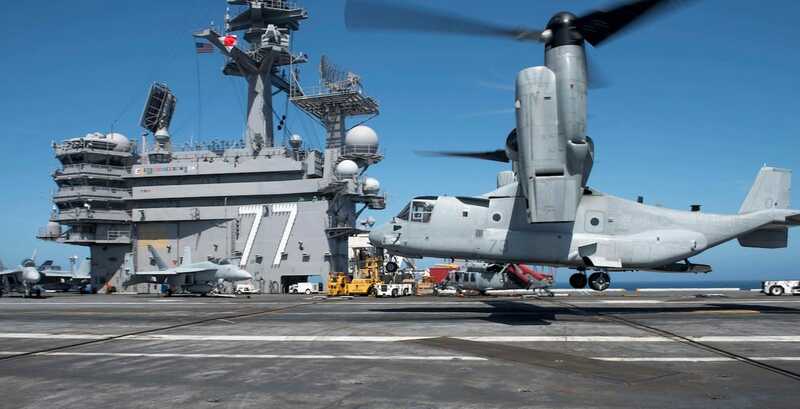 The Navy plans to run CMV-22 operations out of Naval Station Norfolk in Virginia and out of Naval Air Station North Island in San Diego. The changeover to the new aircraft is expected to start in 2020 and wrap up in 2028. 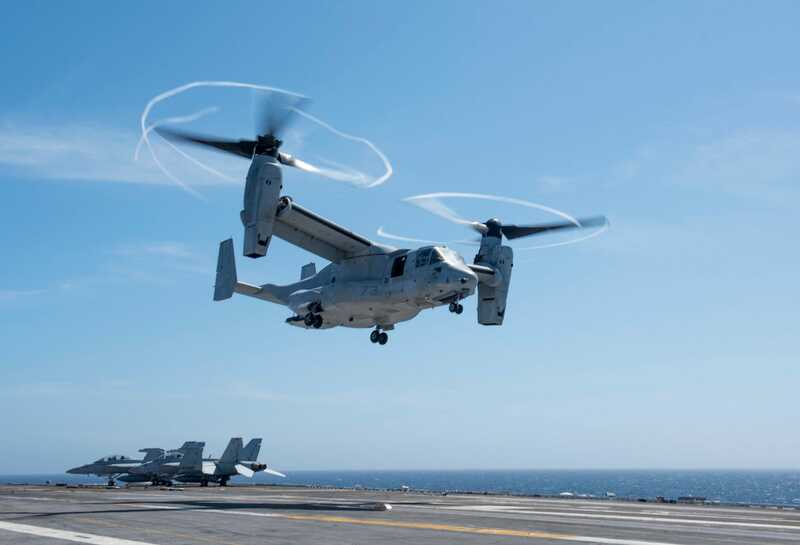 Lt. Gavin Kurey, the first Navy pilot to land a CMV-22 on an aircraft carrier, said the transition to the Osprey for carrier onboard delivery represented a major change. US Navy/Mass Comm. 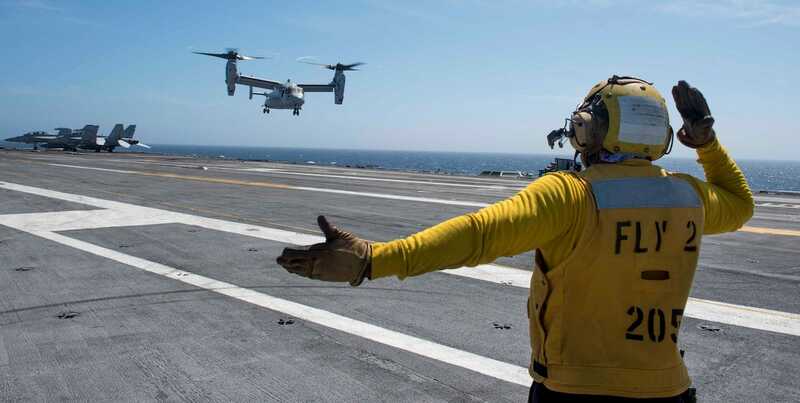 Specialist 3rd Class Roland JohnAviation Boatswain’s Mate (Handling) 1st Class Marlon Daley directs an MV-22 Osprey on the Bush.